I spent the better part of the week thinking over what Angus had said about the expedition and about what Sonea had told me when she said that the plague wasn’t over. I had initially brought up the expedition to Sonea, but she had been tight lipped on any advice of what I should do, or where I should go. So, instead, I had written to Uncle Maron about the whole thing. His letter was due to arrive any way, but then the messenger arrived from the Capital City, and everything was thrown into chaos. Arthas had returned as expected. The parades had been prepared, the celebrations ready to commence. Instead, from what the messenger had gathered, the Prince had killed his own father, right there in the throne room. Then, Arthas revealed his forces, a new army of undead that seemed to work under his will. They slaughtered hundreds, and as those citizens fell, Arthas made them rise again as new soldiers in his growing army. By sundown, the city had been completely sacked. The Violet Citadel had thought about restricting this news, but they soon realized it would do them little good. Instead, they announced it to us all publicly. The Kingdom had been betrayed by its own. The nobility was lost. Any sign of order that had been established after the plague would evaporate in the coming days. I tried to take in the news. There was just too much for me to comprehend. Arthas had been a hero of the Alliance. He had stopped the plague. Appoleon had been at the capital when Arthas returned. Like the guardian angel I had once known, Sonea seemingly appeared from nowhere and covered me in her arms. Holding me as I cried for the loss of my friend, for so many innocents, and for the end of the world that I knew. The morning came, and like any other morning, the world continued to spin on. It’s funny, in the novels and stories, the world always just sort of ends, suddenly and with a loud band. Here in Dalaran, things seemed the same as ever. The cows were brought in for the slaughter, students went to school, and businesses were open and operating. It didn’t make sense to me. The kingdom had fallen. Weren’t we all supposed to be running for our lives? In class, my fellow students had lost their resolve. For me, the passion for the loss of my friend made my fire magic glow stronger than ever. Angus, truly impressed by my skill, once again called out to me when he dismissed the others. “Have you made a decision?” he asked. “I thought hearing about the capital’s destruction may have swayed you,” he replied. “All good thoughts,” Angus said. “So this expedition is a retreat?” I posed. I thanked him and left the room. Back at home, Lady Sonea was busy again, scribbling away as she often did. When she heard me close the door she twisted around and gave me a comforting smile. Despite her seemingly quick decent into madness, she always dressed well and spoke calmly. She was not the typical stereotype of what one expected when they mentioned a crazy person. But crazy she seemed to be, none the less. “Is that really what it is?” I asked. “In a way, yes,” she responded. “You’ll tell me?” I asked. I couldn’t believe it. I threw down my things and came to sit next to her. “Will Dalaran fall?” I asked. My gut was twisted in knots. Nothing made sense anymore. I stayed here in the quiet room with Sonea for a few minutes and then stood and went to my room. Behind me, Sonea continued to scribble feverishly against the parchment on the table. The next day, the ground shook beneath our feet. A quel’dorei mage appeared in Dalaran a few hours later. The sunwell had been corrupted. The elven kingdom of Quel’Thalas had been destroyed. 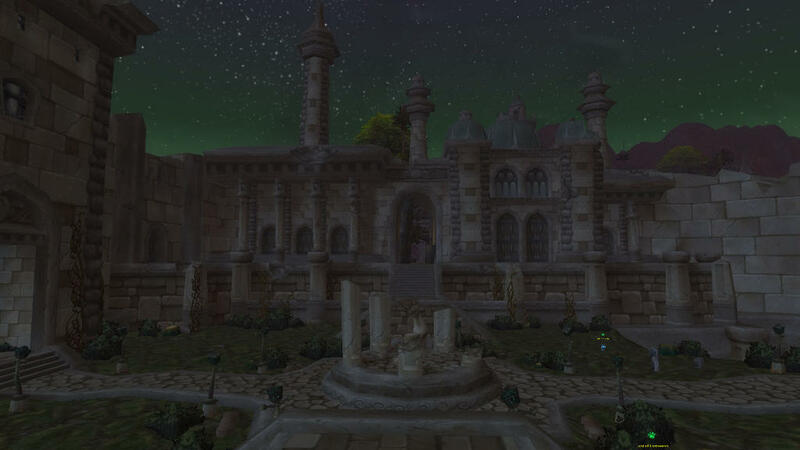 Silvermoon city was sacked, and Prince Arthas would now set his sights on Dalaran itself. Many of the older mages were put on high alert and called to the attention of the Kirin Tor. Others, like Angus, began packing their belongings. I went to my teacher’s dwelling in the citadel and he opened the door to let me in before rushing back to his wardrobe. It was a retreat then, not an expedition, not a mission to save the future. This was the Kirin Tor admitting defeat and preparing to flee to safety. “Should we sail to Gilneas first?” I asked.